Well once again it has been a while since posting. no excuses other than all the ones I can make up right. . . .. . now! Nope, none. well here is a photo or two from the last bicycle swap meet I went. 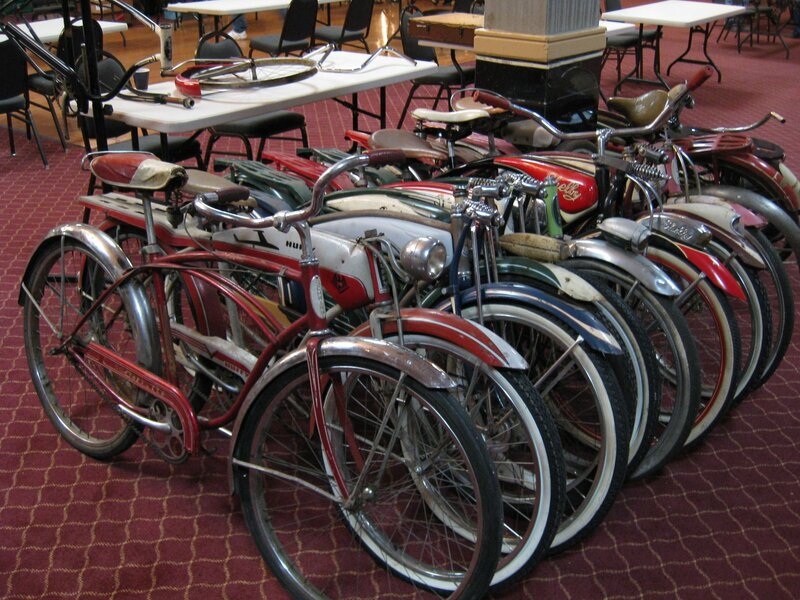 It is a pile of vintage balloon tire bikes that Sam Fitzsimmons was trying to sell. Excellent pile of bikes, Schwinns, Shelby, Huffy, and others. Here is a pair of Bowden Spacelanders. This are some of the rarest bikes built post war. i think there was around 500 or so built in 1960. This have sold for as much as $8000 many years ago. Funny seeing two, side by side. Just so you, they were made with really inexpensive parts, and were extremely heavy. 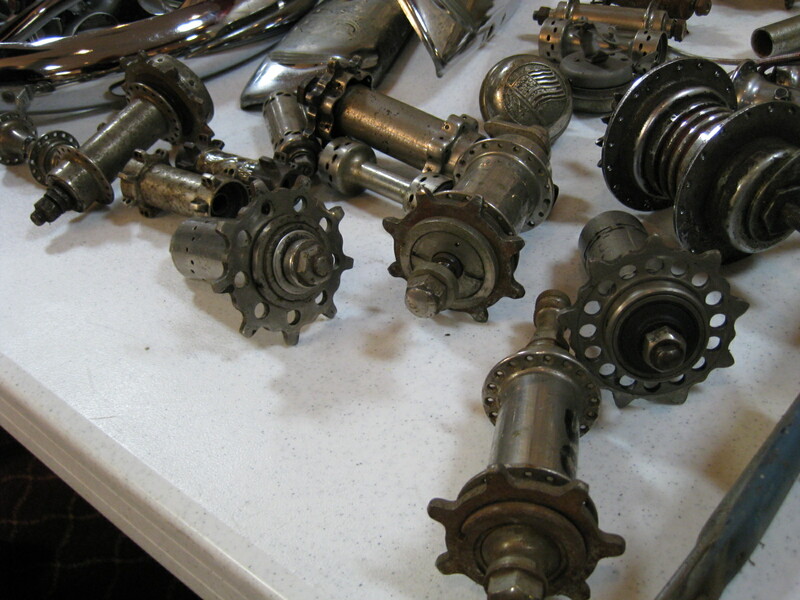 Here is an awesome table full of turn of the century hubs. Some take normal hook end spokes while others use straight ball-end spokes. One could see the adaptation of these 100 year old with the modern hubs found on modern ultra lightweight boutique wheels found by Mavic, Campagnolo, and Cane Creek. The swap meet catered more to balloon tire and older bikes, but i did come across a few lightweight bits, including a rare Colnago crankset with 6 arms, rather than the usual 5 arm spider. Also came back to the shop with a handful of Campagnolo Nuovo record cranks, brakes, small bits, 20+ vintage cycling caps and even a couple spare Clement Seta sewup tires. Oh, almost forgot, I got a Harden rear high flange track hub (not a Bacon slicer) laced into a period sewup rim. will post future swap meet booty as they are captured. Live vicariously through my life on the road. SPACELANDERS! Geez. Those look like they should have motors. turns out this super rare bike, that I see up for sale once every 5 years or so, the seller told me he bought 11 of them! there goes the retail value once everyone knows there are a bunch of them out there, and soon for sale.p.s., thanks for looking!